As a community, us sneakerheads love to be on top of breaking news and the leaked images of the Nike KD 8 were a piece of news that set the internet on fire. At the time it seemed like you either loved or hated it but you atleast had a take on it. After many wear tests, model adjustments and such, Nike is finally showing off Kevin Durant's new wheels and the final product is pretty amazing. A one piece Flyweave (space grade woven textile) upper provides flexibility and a lockdown fit while the Zoom Air went in a compltely new direction from his previous models. The reengineered and rebranded articulated Zoom Air is visible throughout the entire base of the shoe, a first for the KD signature line. The new landing pads will allow for maximum cushioning while giving Kevin all the movement and flexibility he needs to get his silky smooth game going on the court. The midsole and heel counter are an integrated one piece panel that will allow for a fluid and snug fit while the outsole takes on a one piece, continuous Herringbone traction pattern that will grip the court in a new way. What do you guys think of Kevin Durant's new kicks? Are these growing on you yet? If so you will only have to wait a few days as the shoe is set to launch on June 27th in the "July 4" edition and then an all red model on July 11. 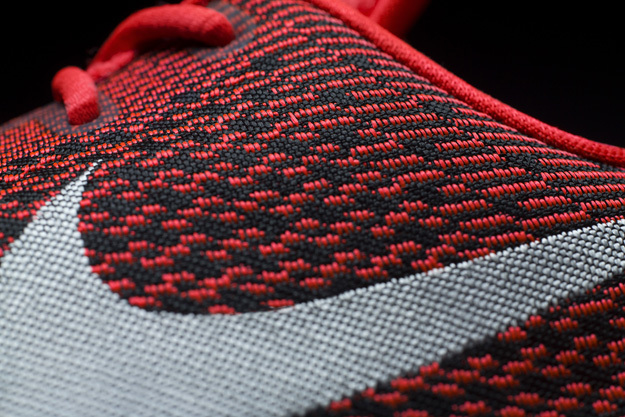 Make sure to stay tuned to SneakerShouts for any updates on the Nike KD 8.